Real-time location data lets newsrooms deliver relevant stories to people when it makes the most sense. A view of background location tracking information for HERE app users. Oftentimes local news stories are written about the places we live, work or pass by — but we would never know it because there’s no front page in the physical world. Addressing this issue, and breathing geographic life into local coverage, was the inspiration for our first experimental local news app. Our way of exploring the issue was to test an app that sends people local news stories about where they actually are. 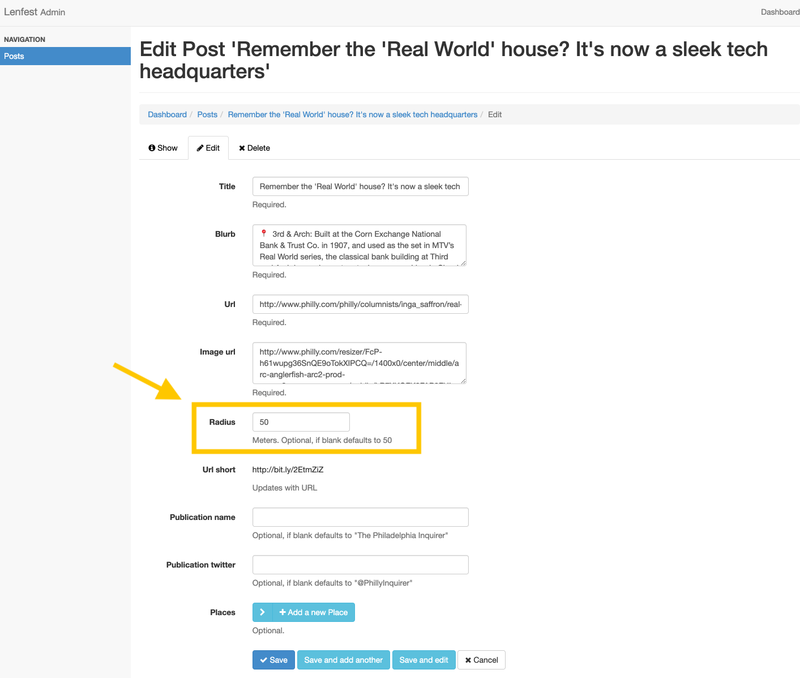 Unlike national or international newsrooms that are incentivized to send or organize stories by continent, country, state or city—local newsrooms can organize stories about neighborhoods, wards, counties, and towns. They write about block-level issues, and if technology lets us deliver stories by block now, the chances that a nearby local story will be relevant to someone increases significantly. The Hypothesis: Local news stories that happen nearby are highly relevant to people. The Test: An app that sends local news story notifications when people walk by a place that’s been written about. The Content: Evergreen stories about art, architecture and real estate and from The Philadelphia Inquirer. The Numbers: 350+ people have installed the app and 100+ have received notifications. Not everyone has received notifications because of the number of stories (~60), the urban concentration and because we skip notifications when people are driving. Of the people who did receive notifications, 40% engaged with them. The Lessons: We saw early signs that location-aware story notifications about topics people are interested in may be up to 4x more engaging than regular news alerts (the sample size is small, and the insights are directional), but we also learned that people may not want to stop to read an entire article while out walking. We learned that new newsroom roles and tools would be needed to support these products at scale, including better location databases, editors for “places” and a revamped CMS—but that the opportunity to connect with local readers at important moments could be big. Last, location-aware products have the opportunity to leverage or maintain trust with readers and can create more value from lots of local evergreen content. The Future: Next up we’ll continue our exploration of the link between location and new local news products by making local professional restaurant reviews easier to search, browse and save based on location. If you’re interested in exploring new products for local food content, let us know and we’ll send you a preview of our research and designs before we launch the experimental app next month. Want to Know More? : Keep reading to learn more about how the idea developed, how we promoted the experiment and more details about what we learned about the relationship between where a story is written and its audience. *TY Joseph Lichterman for the TL;DR format inspiration from Solution Set. A few months before launching the app we approached The Philadelphia Inquirer about collaborating on a location-aware app. 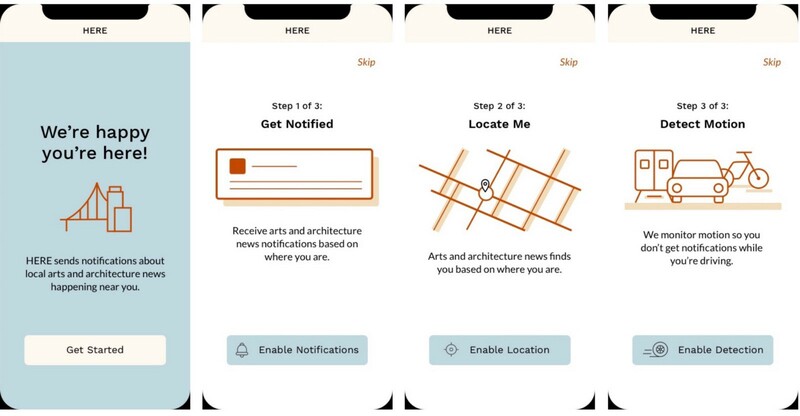 We envisioned an app that would know where someone was throughout the day, and if that person passed by a place the Inquirer wrote about, they would receive a notification. Effectively, we wanted to test turning streets in Philadelphia into a personal local news homepage. We also had Inga Saffron’s architecture coverage in mind. Inga is a Pulitzer Prize-winning journalist who has covered the region’s architecture, planning, and development for nearly two decades. Her coverage was a good starting point because her stories tend to be relevant for a long time, and we liked the idea that something other than the endless news cycle would drive people to use the app. Instead, their actual pathways through the city would set off news notifications about where they were, block by block. This wasn’t going to be a news walking tour, it was going to be a news tour of where they were walking. After having a few more conversations with the Inquirer and with Inga, we decided to add some public art and real estate stories to the app. Art and real estate content were a natural fit alongside architecture, and including them would expand the size of our potential audience for the experiment. So now we had an even bigger pool of high-quality evergreen local stories to pull into the app. They wouldn’t need frequent editing or updating by the lab, and the stories were tied to a single place which made geotagging and testing relatively easy. We also thought sending people notifications about buildings they could look up and see would make the notifications easier to understand. In the future, we could imagine this method working well to surface other types of local news stories, including important local coverage about school safety like with the Inquirer’s Toxic City investigative report, paired with the full safety report for the school nearest to you. The same goes for a story about a new musical for children opening at a local theater. Parents walking by the Arden Theatre in Old City might want that story to find them, rather than the other way around. Until we know more about when and where people like receiving stories in this way, we’ll keep taking small steps towards what we think is a much bigger idea. People’s first experience with the app is the series of welcome screens above, asking for user permissions that will make the app work. We ask users to allow access to their location and also to detect their motion so we can skip notifications while they’re driving. 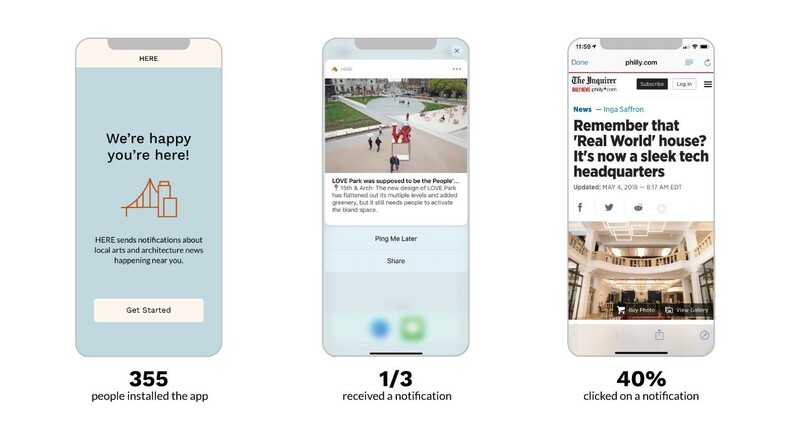 We don’t want the app to distract people’s attention from the road, and we want to make it easy for people to stop and engage with the notification and the story. As we point out later in this post, stopping to read a full article when you’re walking in the city might not be the ideal experience for everyone, and we’re aiming to test new formats in our next iterations of location-aware product experiments. LOVE Park was supposed to be the People's Park. How did it end up as a granite Sahara? He taught himself to draw in prison. Now he's winning over the art world. All of these stories are clustered geographically around Love Park, a public plaza adjacent to City Hall. The stories are about a mix of topics, including a critique of Love Park’s recent overhaul, a story about the renovation of a former bank building and a profile of a local muralist. You can read even more about the thinking behind the app in our intro post and also get a peek into our research and design process here. The underlying notion for this experiment was the lab’s strong belief that leveraging location information is where local news has a unique advantage to test out new and innovative product experiences. We also believe that incorporating basic principles of location into local news products will benefit many stories and many audiences down the line. But this app was our first test of that idea, and there is more to learn. 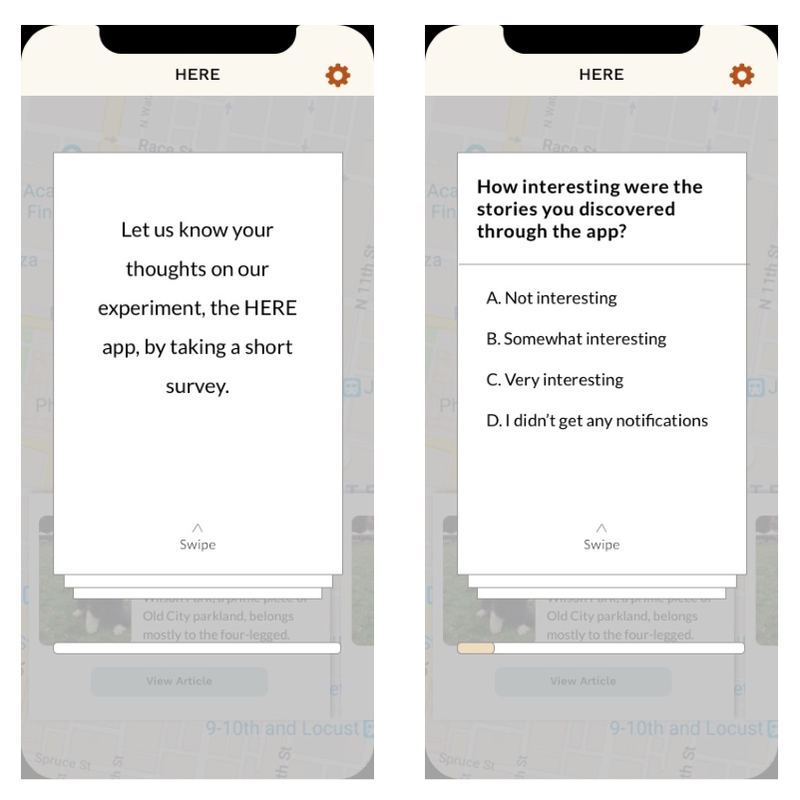 Knowing that our plan is to hopefully expand beyond arts, real estate, and architecture content, and to hopefully launch experiments in other local markets, the lab launched the HERE app in mid-November. We conducted our first round of analysis two months later in mid-January, and recently took another look at the engagement patterns to see how the app has been performing so far in 2019. All of what we did and learned is below, which starts to answer two key questions: do people want to receive local news about the places they actually are, and should newsrooms invest in the resources and tools to deliver it this way? Since this is just an experiment, promotion was light. The Inquirer published an article about the app on Philly.com and it was tweeted out to a few groups we thought would be interested in it, including Philly.com readers (Philly.com is The Philadelphia Inquirer’s website), Inga Saffron’s followers (since her journalism provides the foundation for the app) and followers of the Lenfest Lab. The number of stories. There are only about 60 stories in the app which limits the opportunities people have to walk by a place a story has been written about. We can add more and we will, but it’s currently a manual process handled by the lab. The implementation of motion detection. Also, anyone who isn’t walking won’t get a notification. So far more than 1,000 notifications have been sent but nearly 6,000 have been skipped because people were driving, riding public transportation or otherwise moving too fast to receive one. The urban concentration of stories. 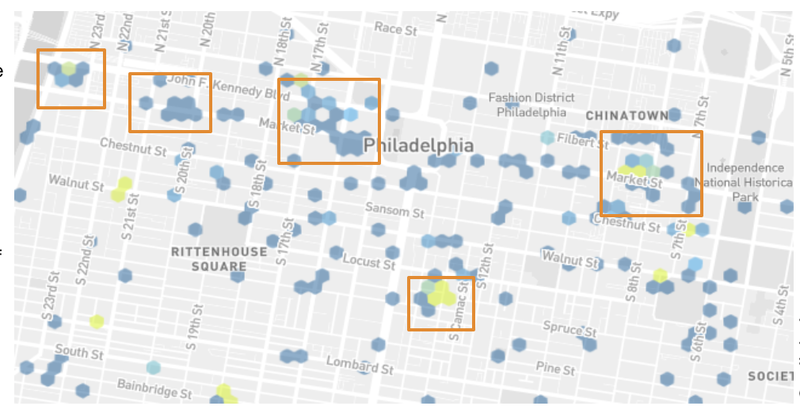 We selected stories located in Center City because there was a lot to choose from, and we also knew the chances would be higher the people in the city would be walking instead of driving. However, that means that suburban app users can only receive notifications when they come into the city and walk around. After observing our own workflow, as well as the behavior of people using the app for five months, we’ve learned a lot about how and why a newsroom might want to consider testing these types of products, and we’ve turned the insights into the ten key takeaways below. 📍 Early signs show that location-aware notifications about a topic people find interesting can be up to 4x more engaging. The engagement rate for HERE app notifications peaked at 14% while an average news alert gets a 3.4% engagement rate. This starts to show us that paying attention to where people are and what they’re interested in can pay off when it comes to engagement. The most common news alert—breaking news—definitely appeals to a lot of readers and can drive immediate traffic, but curated alerts for people based on what they like reading about where they have the potential to drive even more meaningful experiences with local news coverage. The data is directional given the size of the group, but it still shows a 4x increase in engagement over less customized, less location-aware notifications. If newsrooms applied this approach to more local stories, audiences might start relying on them to get trustworthy information about what’s going on around them in real time. The engagement rate for notifications was 10% on weekdays and 14% on weekends, with most clicks coming on Sundays. Proof that people have more time to read news on weekends isn’t a new insight, but it was a useful reminder that even though technology allows us to reach people wherever they are, whenever they’re there—newsrooms should still think critically about the weekday vs. weekend habits of their audiences and build new location-based products that are adaptable for different contexts. Location-aware features quickly put stories in the hands of people nearby and let evergreen content become relevant again in the places where people go. It opens up a whole new set of possibilities for digital news delivery unconstrained by screen dimensions or third-party algorithms. A new kind of Giant is coming to 2303 Bainbridge St.
An editor could decide that this story is only relevant to someone who lives in that neighborhood and not someone passing through. But they also might want to send the notification to a non-resident because they’re interested in commercial real estate news. If newsrooms could select or combine those types of audience characteristics in their own content management systems, rather than select segments through other platforms or tools, they could regain control over the end-to-end local news distribution funnel as well as many related business models. We were glad to see hundreds of people install the app and also give it permission to access their location and motion. We attribute much of this behavior to the trust people already had in Inga Saffron and the Inquirer and was supported by the transparent language written into our welcome screens. 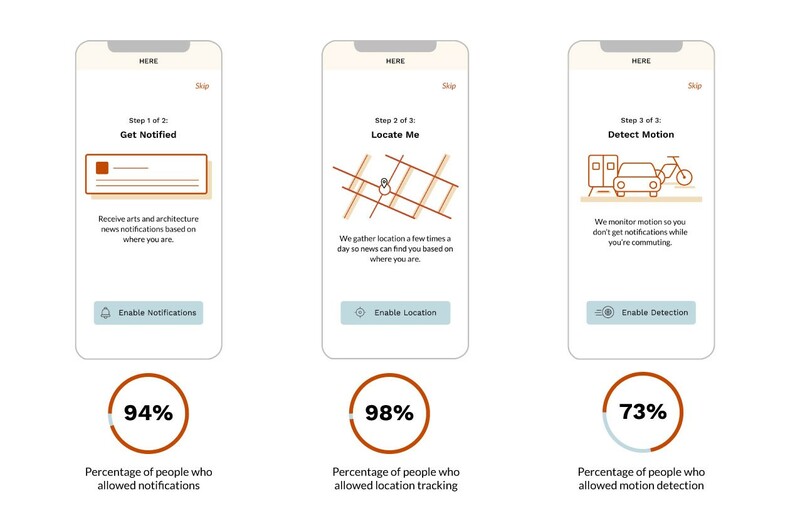 We were thoughtful about the clarity and accuracy of words we used to explain the experience to people, and we were happy to see that 94% of people let the app send notifications; 98% allowed it to access their location and 73% of people let the app detect whether or not they were driving. Directly following a Tweet from Inga, app installs doubled from 150 to 300. We were impressed by the impact of Inga’s tweet for two reasons. First, because it seemed to cause a spike in downloads, but also because it kicked off an online conversation about the app with other local journalists, city employees, and architecture fans. This app inspired the creation of a new CMS field: the ‘radius’. We used the radius to set the geofence for each story notification. 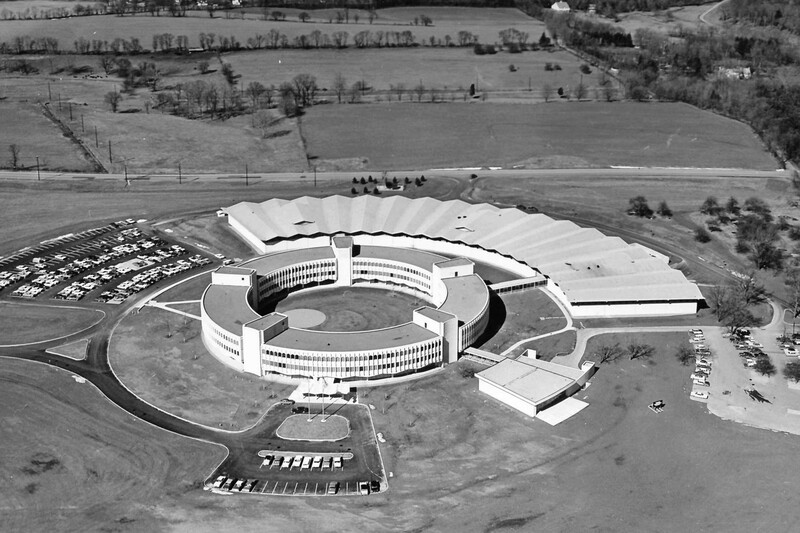 (For more on how the CMS was built and instructions for using it yourself, read this.) Setting the radius field each time let us decide how close someone should be to receive a story notification. For stories about narrow buildings on a city block, we set the radius to the closest distance that tested well, 100 meters. That distance was the default range if we didn’t change it, and in the context of an experiment setting the radius was easy. However at scale, this would add a new dimension to the editing process, and someone would need to determine how close a reader should be to a story to receive a notification. In late November of last year, Inquirer reporters Jason Laughlin and Patricia Madej published this piece about Amtrak’s announcement that the flipboard would be replaced with a digital sign the following January. Meanwhile, Inquirer columnist Mike Newall had written about the impending switch two years earlier in the summer of 2016. Back then, there was “no timetable for the change”. Fast-forward to early December 2018, when Inga Saffron published her opinion on the issue, urging Amtrak to keep the sign as part of their “heritage”. A few days later, Inga published a piece about how a local congressman was negotiating with Amtrak to possibly replace the old flipboard with a new one that kept the clack. Then in late January, she finally published a story letting everyone know that work had begun to start removing the sign. A few days later Inga’s wrote about how the new digital sign was up but that it was “utterly charmless”. He wanted to share news that the app was working well, but I quickly noticed that the story notification he received was out of date and needed updating. Even though much of Inga’s coverage is evergreen, some of it relates to developing stories like this one and so an editor would need to make sure that the latest, or best news is attached to each location. We had ongoing conversations in the lab about how we might apply different user experience rules if people were in the city, the suburbs or in a rural area. In the city, you might want to send a notification to someone who comes within 100 yards of a story location, but in the suburbs, you might want to send a notification to people driving within five miles of this Baptist compound in King of Prussia, PA.
Technology makes all of these new types of story delivery possible now, and we can even send notifications silently if we think they’ll be too distracting in the moment. The key will be paying enough attention to these distinct user experiences to start testing the right new rules. 📍 Evergreen stories are great to experiment with if you want to observe behavior over time, across seasons, etc. Unlike a one-time news event like an election or the Super Bowl, you can keep these types of evergreen, location-aware products available for a while and see how behavior changes over time. We’re keeping HERE in the App Store for now and will update it with new stories when we can. We’ll keep an eye on it to see if engagement changes at all in the spring when more people will be outside exploring the city. If it does, we’ll be sure to share what we learn. With this experiment, we just scratched the surface of how newsrooms might organize a locations database to accelerate location-based product development. For local architecture content, tagging a single location was relatively easy—but for less straightforward stories there may be many locations associated with the narrative or none at all. All of those decisions would need to be carefully considered by experienced editors and reporters and data would need to be stored in a useable way. We were clear in the app’s welcome messaging that we would gather location data a few times a day to help news find you where you were. We gathered this data because we wanted to focus our lab’s limited resources on including stories in the app that were about places people walked most often. We found that people who installed the app were often walking up Market Street or JFK Boulevard between City Hall and 30th Street Station and we did our best to pull in stories about those areas. The information was also good to gather since it’s just one early data point showing how some Inquirer readers move through the city and when. Local newsrooms could use this information to help refine ideas for experiments or new product ideas. 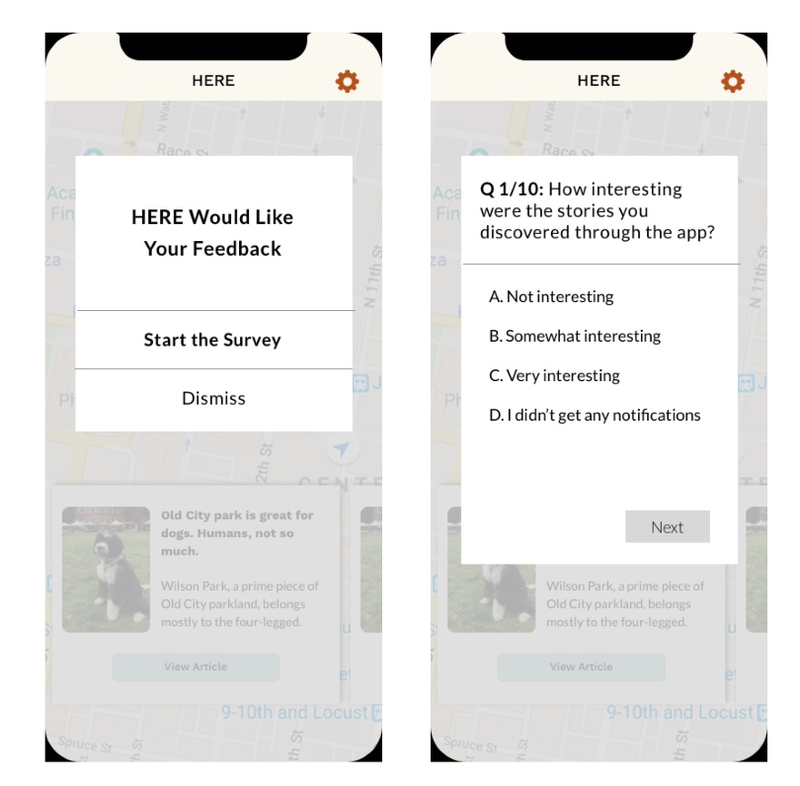 We’ll request an email address when people install the app so we can email them a survey about the experience later on. Some qualitative feedback we received internally was about the tension between walking by a building and stopping to read an article. Next time we‘re going to explore new content formats that are easier for reading on-the-go like shorter pieces, highlights or audio. To additionally ease friction between walking and reading news, we’re thinking we might email stories to people about places they’ve been nearby so they can read them later when they have time. Many local news organizations today are focusing their efforts on big strategic wins. Meanwhile, the insights from our smaller experiments can leave organizations wanting more confidence that the results would scale to a larger audience. As a result, we’ll be taking a closer look at the sample size of our experiments and do our best to make sure they’re as representative of broader audiences as possible. One reason to run experiments is to quickly discover new products that audiences truly value before building them at scale, which is sometimes called finding a product-market fit before figuring out how to make money. The experiments we run in the lab are intended to find local news product-market fit, which means we’re testing the value of a business model before moving onto the revenue model. Local news revenue models today are under a lot of pressure, but in our lab, we focus on what we can control: the quality of the user experience. At the same time, we’ve found that it’s important to sketch out potential business and revenue models for ourselves and our collaborators while we’re building the experiment. We think this will help give stakeholders the information they need to understand how scaling a successful experiment would benefit a bottom line. Our next experiment will focus on making local professional restaurant reviews easier to search, browse and save for quicker and better decision making—whether people are long term planning or are on-the-go. It will also incorporate features from the HERE app, letting you know when you’re near a restaurant that you’ve saved as a favorite. We’re looking forward to building on these insights and continuing to explore location-based opportunities for new local news products. Let us know what you think! Also if you want to connect about any of these insights or collaborate, please reach out to us anytime via email (sarah@lenfestinstitute.org) or find us on Twitter (@lenfestlab). The Lenfest Local Lab is a small, multidisciplinary product and user experience innovation team located in Philadelphia supported by The Lenfest Institute for Journalism. The Lenfest Institute for Journalism is a non-profit organization whose mission is to develop and support sustainable business models for great local journalism. The Institute was founded in 2016 by entrepreneur H.F. (Gerry) Lenfest with the goal of helping transform the news industry in the digital age to ensure high-quality local journalism remains a cornerstone of democracy. Thanks to Burt Herman, Joseph Lichterman, and Brent Hargrave.